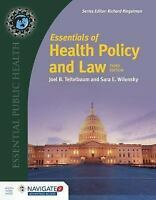 Essentials of Health Policy and Law: By Teitelbaum, Joel B. Wilensky, Sara E.
Illuminates the increasing collusion between Big Government and Big Business to "manage" our society in the interests of the elite. Widely acclaimed and hotly debated, this provocative and original look at current trends in the United States presents a grim forecast of a possible totalitarian future. The author shows how the chronic problems faced by the U.S. in the late twentieth century require increasing collusion between Big Business and Big Government in order to "manage" society in the interests of the rich and powerful. This "friendly fascism," Gross argues, will probably lack the dictatorships, public spectacles, and overt brutality of the classic varieties of Germany, Italy, and Japan, but has at its root the same denial of individual freedoms and democratic rights. No one who cares about the future of democracy, in this country and around the world, can afford to ignore the frightening possibilities of "Friendly Fascism."